This week I reached a milestone–posting my 100th book review for Amazon. Initially, my reviews were text only. But after I learned video production, I started providing video reviews. It’s more enjoyable to talk about a book I like than to write about it. Also, Amazon visitors welcome the break from written reviews. 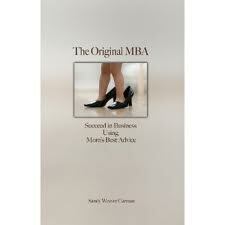 Above, you’ll see the cover of The Original MBA, the book I chose for the 100th review. The cover features a little girl in her mother’s shoes–reflecting the book’s central theme, how a girl learned valuable lessons from her mother. You’ll note that I gave a 5-star rating, and recommended that you get your own copy and copies for your work colleagues. You might wonder why I give high ratings to practically all of these books. The answer is simple. I wouldn’t spend my time reading a book, much less reviewing it, if I didn’t consider the book worthwhile. In most cases I don’t know the authors personally. Yet when I do, that doesn’t influence my evaluation. In fact–to maintain my professional ethics standards–I have politely declined to submit reviews of books that didn’t appeal to me. Sandy and I will welcome your response. Did you learn valuable lessons from your mother, that led to permanent improvements in your life and business? What were they?